There is an old joke that the only sure things in life are death & taxes. Even in divorce you still have to worry about death and taxes. Death: I have had several pending cases ended by death. In one instance my client’s spouse died very suddenly of an accident. It ended a contested divorce and custody case that had been progressing very slowly and not particularly amicably. While the divorce and custody issues were over, it created new issues with the deceased spouse’s family. Grandparent visitation issues and intestacy issues arose, since the spouse died without a will (intestate). This made the surviving spouse and children equal beneficiaries. This was something the deceased’s side of the family was not to keen about. I was also involved in a case where the non-custodial parent got custody of the children when the custodial parent died after the case was “over.” They had been divorced for a few years. But upon the custodial parent’s death the children when back to the surviving parent. Death does not end the issues you have with the other parent or former spouse. I know a lot of divorcing spouses may think it will solve all of their problems if that so-and-so would just die, but it could leave your children without their other parent. It can create issues with the former in-laws, who now may be pursuing their rights of grandparent visitation. It can create financial uncertainty as support obligations end at death, usually, and there might not be insurance or enough insurance. 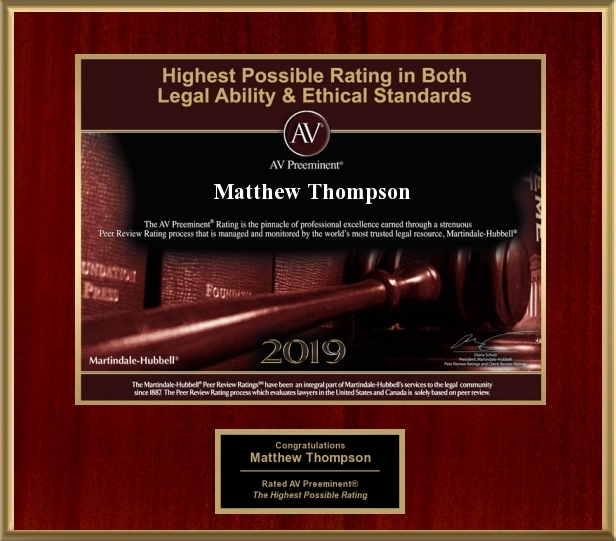 Matthew Thompson is a family law attorney that hopes your case is not prolonged or shortened due to the death of your attorney. (Taxes will be the subject of another riveting post). Previous PostRinging In Valentine’s Day; Who gets the Ring when things go Wrong?Next PostDomestic Relations vs. Domestic Incarcerations; Jail for bad behavior.